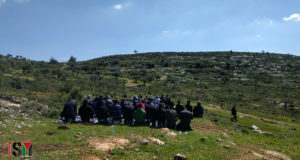 Friday, 26 June 2009: Bil’in village holds press conference and a demonstration against construction of the Apartheid Wall. 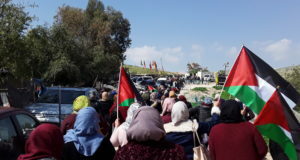 Palestinian residents, alongside international and Israeli activists gathered today in Bil’in to demonstrate against the Wall. After the press conference, Palestinian, Israeli and international demonstrators marched from the village towards the site of the Wall. Chanting slogans against occupation, protesters arrived near the Wall. Israeli forces shot tear-gas at demonstrators, including the use of the cannon (which shoots off many gas canisters at once). Several suffered from heavy tear-gas inhalation and required medical attention from medical personnel.